Looking for low calorie recipe but healthy? 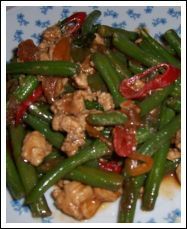 Try this Green beans recipe with ground chicken. It has an excellent taste and it meet the needs of diet friendly dish. This oriental recipe is using by many people in Indonesia because it's very cheap and easy to make. You don't need a special skill to make this simple but delicious green beans recipe. I use a little bit red chilies and green chilies in this recipe. If you want to make it for your children, don't use them, it's a little bit too hot for them. Of course the taste would be different, but that's ok. After all most of the children like green beans, so it's worth of try. And it's easy to make and fast. In total you'll need 40 minutes to cook this vegetable recipe including cleaning up the fresh green beans. But if you use frozen green beans, it's shorten the time of preparation. You just need 25 minutes to make this recipe ready on your table. Slice the beans in 2 inch lengths, or if you use frozen green beans, they are already on length. Heat the sesame oil and add the minced garlic and shallots. Stir it until fragrant. Add the ground chicken, fry it until the chicken is done. Add the red chilies and green chilies. Stir it occasionaly for a few minutes. Add the beans, light soy sauce, tomato and salt. Add some water and cooked them for a few minutes until the beans are tender, but still crispy to the bite. And for the last, add the basil leaves. Stir it. Remove.